Welcome to DataChant Gallery! This page showcases Power BI dashboards that were demonstrated on DataChant. Some of these reports are available for subscribers, others can be purchased here. Slow download? This page contains many embedded Power BI reports. Please be patient. The reports are now loading… Till they do, you can follow me on Twitter to get the latest news. All the data in the dashboards below is authentic and public. It can be obtained by Power BI and Excel without any help from your IT organization or any expensive Software Development outsourcing. Purchase Twitter Analytics report that compares between competing brands on Twitter. Analyze the sentiment of your social team’s messaging or the mentions of your audience. 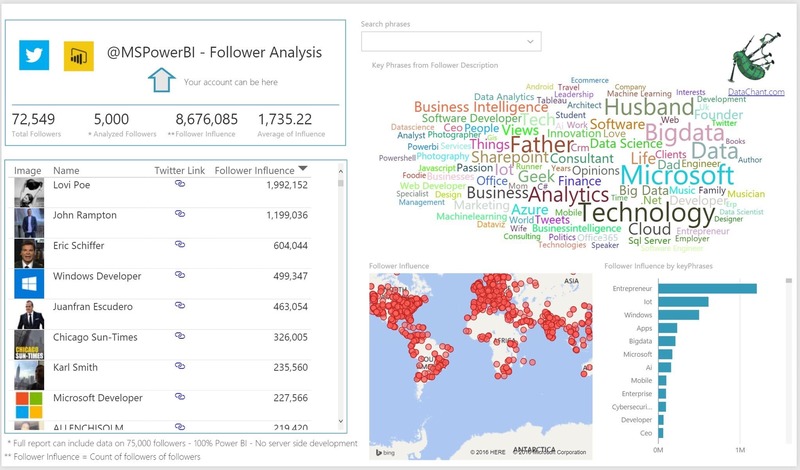 You can order a Power BI report (.PBIX file) with unique insights of your brands’ followers on Twitter. The report analyzes Followers by influence and location, and group them by key phrases according to their profile description. Click here to view the report in full screen. Learn more here. Check out our latest comparison between Netflix, HBO, Hulu and Amazon Videos. Who gets more Likes? We continue with three Facebook analytics dashboards on the US presidential race. The first dashboard showcases Facebook Reaction Analysis (Like, Wow, Love, Haha, Sad, Angry). You can have this dashboard on ANY Facebook page including your competitors. The second dashboard reveals an amazing storytelling experience. You can click the play button of the Pulse Chart, and watch different top posts popping ups, based on the selections you make. 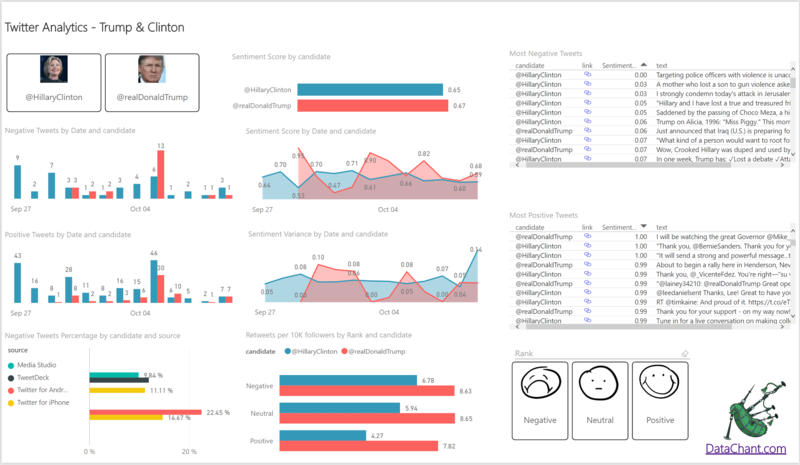 The third dashboard introduces Sentiment Analysis of Trump’s and Clinton’s Facebook posts. You can have such a dashboard on your Facebook pages, your fans’ comments, your competitors, or any other textual feed. In this dashboard we analyze a specific bank, based on public Facebook data. There are 5 reports in this dashboard, flip through the pages below to view some cool visuals. Here we compare between three competing brands in the self-service BI domain. Flip to the next page of the report to see more insights.